‘Tis the season for rescue and rehoming? 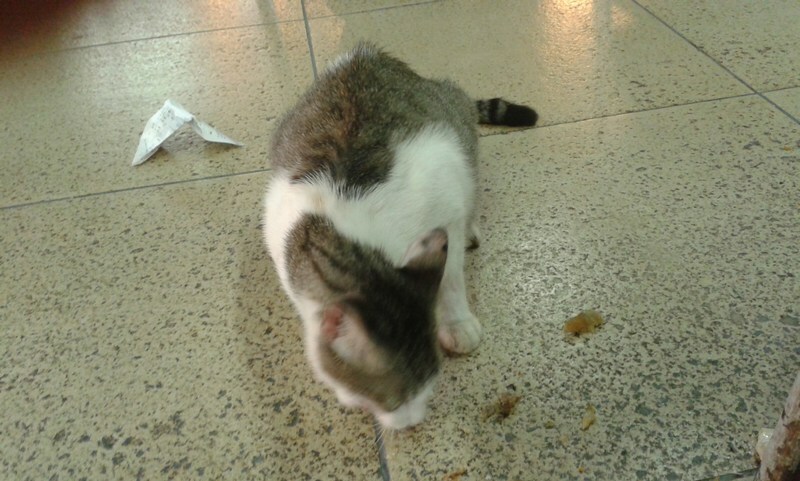 I was having lunch at my usual food court after class today when I saw three students bullying a heavily pregnant cat. They were letting her smell something and then throwing it away from her. In other words, tricking her into thinking it’s food (it is probably some food as they took the stuff from their plates) and then throwing it far away. As we all know, cats normally don’t go chasing after the food scraps if “offered” this way. 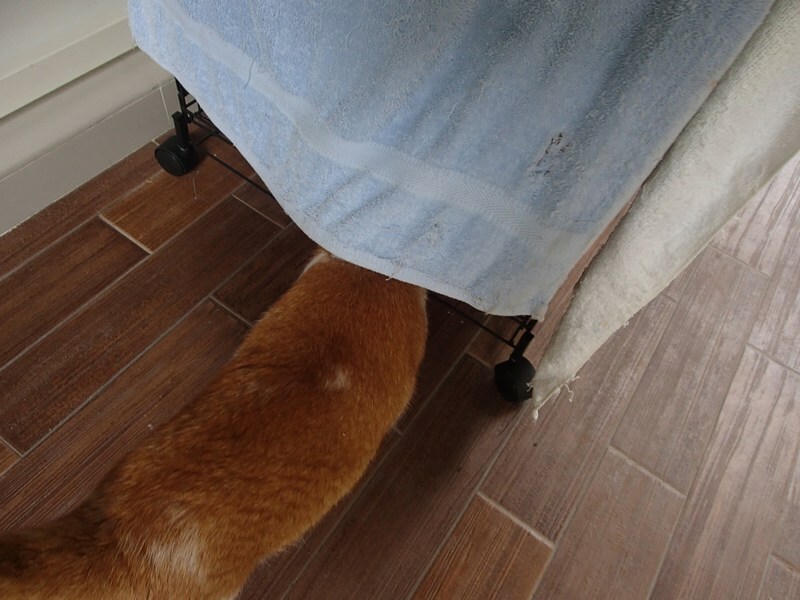 But the poor pregnant cat was probably hungry, so she tried to go after the scraps, but failed to find them. I thought it was rather unkind, so I got some chicken (and the chap-fan man even gave me a fried fishhead – he is a very kind man) and went over to the boys’ table. I squatted down and offered the food to the cat. I was hoping this act would leave an impression on the boys. No need for harsh exchange of words, I figured. Just do the right thing – if they get it, they will; if not, never mind – It’s not time yet for the lesson to be learnt. I don’t think they got the lesson as they were still laughing over it. 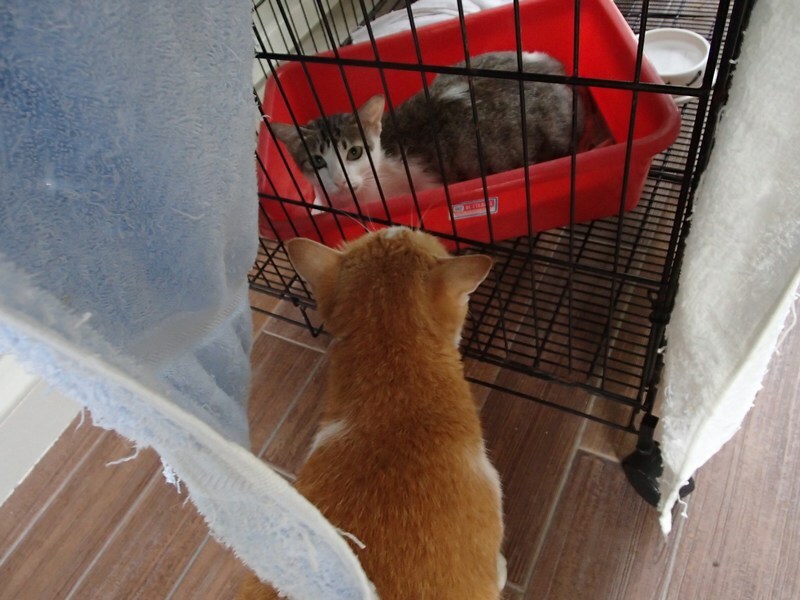 The chap-fan man even offered for me to return the cat to the food court after she has delivered if I cannot adopt her, but please, please, please could you just take her so that she has a place to deliver her babies safely? It’s the rainy season now. But I already have 14 cats. I cannot introduce another cat into Bunny’s Place, and it won’t be fair to bring in a new cat to the patio and let her be a community cat. My neighbours will surely complain. With all rescues, if we cannot rehome, we will have to adopt. So while the pregnant cat was happily devouring the fried fishhead, I texted my cat-loving friend. I told her exactly what was happening to the cat so would she like to take over this cat (and the cat is heavily pregnant). Now, how was I going to get this cat across that busy road, through the college grounds, into the parking lot and into my car? That’s no easy feat at all. She’s bound to be scared once taken away from the food court and she is likely to bite me and kick off me. That would be a nightmare as that road has heavy traffic. I had no carrier with me too. Pray…still your heart and mind, and okay, let’s go….I’m going to get her safely to my car, please…. So I patted her (she’s friendly) and after she had finished eating, I scooped her up, patted her some more and walked out of the food court towards the road. First hurdle: We crossed the busy road. The cat struggled, but I held the scruff of her neck firmly. Now, we were in the college grounds. We were now approaching the parking lot and the cat was struggling! As I approached my car, I saw a colleague and asked if she could help me take my car keys out of my pocket and open my car door for me. I needed both hands to hold on to the cat. The colleague obliged (thank goodness for good help!). Car door opened, in went the cat, car door shut. 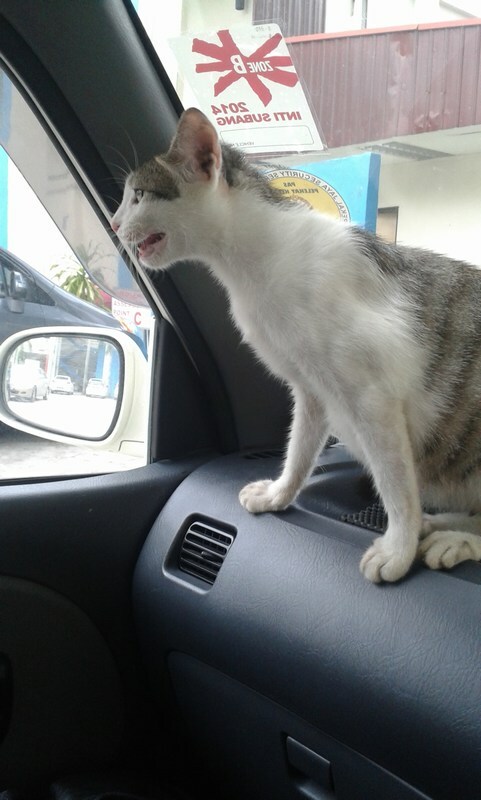 Cat safely inside car now. Now, I had to get into the car without the cat escaping. Cat seemed calm enough, so I got in as quickly as I could. Cat came onto my dashboard and was a little afraid. I told her not to worry as I’ll be taking her to a safe place. I figured I’d have to drive slowly and very carefully as she might be crawling all over the car. But the cat was most cooperative. After we had turned into the slip road on the way home, she went to the back and sat quietly on the floor mat. She was so quiet, I actually had to stop the car to check that she was still alright! I offered her some tuna with salmon (canned), but she didn’t want any. She didn’t want any kibbles either. Daffodil came to say hello. Of course she tried to scale the cage to escape. I had rung Connie to ask if she would be free to take us to the adopter’s house and Connie said she would come over at 3pm. It was then 1pm. 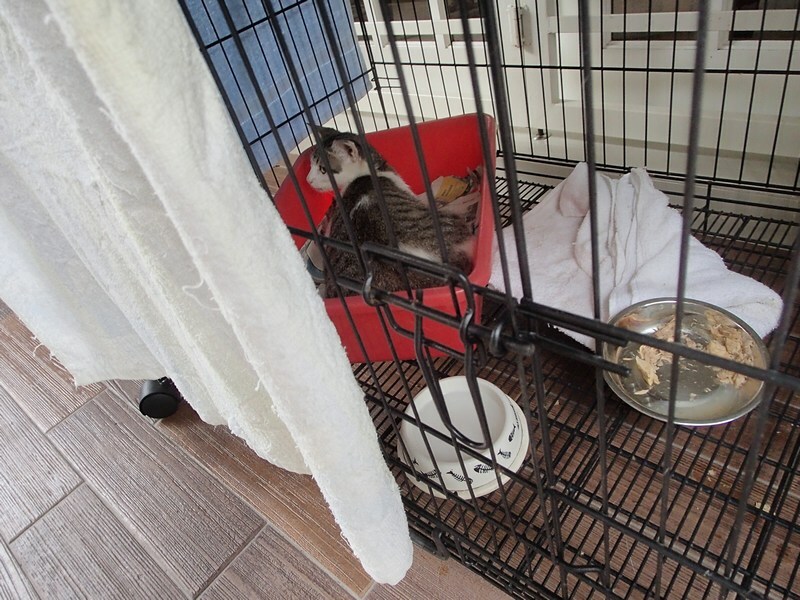 I wanted to minimise her stress, especially since she is heavily pregnant, so I covered the cage with a big towel and let her be. I know she is not hungry as she had already eaten that fishhead at the food court and I’d leave the food and water in the cage for her. She soon settled herself in the litter box and rested. Sweet, sweet Ginger wanted to keep her company. By then, I’d decided her name shall be “Dolly”, reminiscent of the main character in “Hello Dolly!”, the much celebrated and delightful Dolly Levi Vandergelder played by Barbra Streisand. 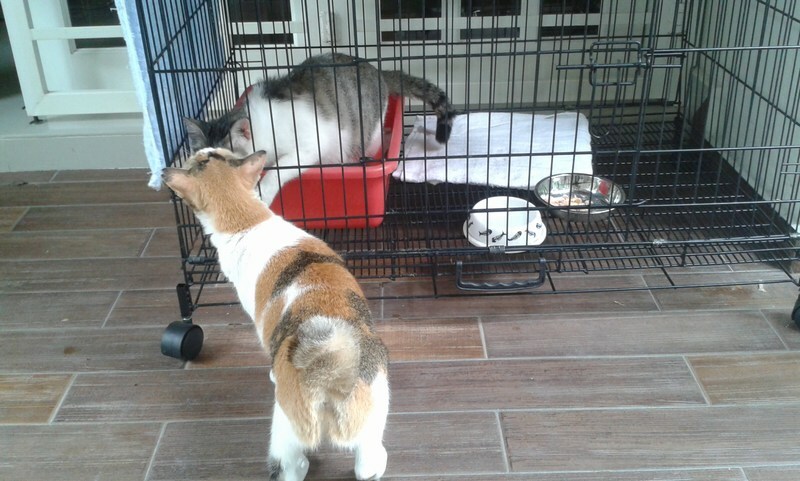 It was almost 3pm already, and Dolly still hadn’t touched the food. 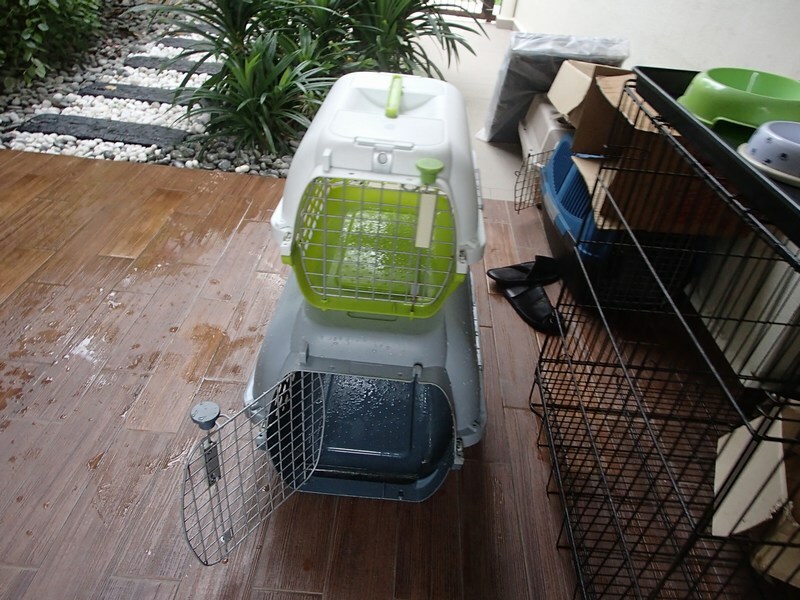 Okay, Dolly, let’s go to your forever home now! Connie arrived. 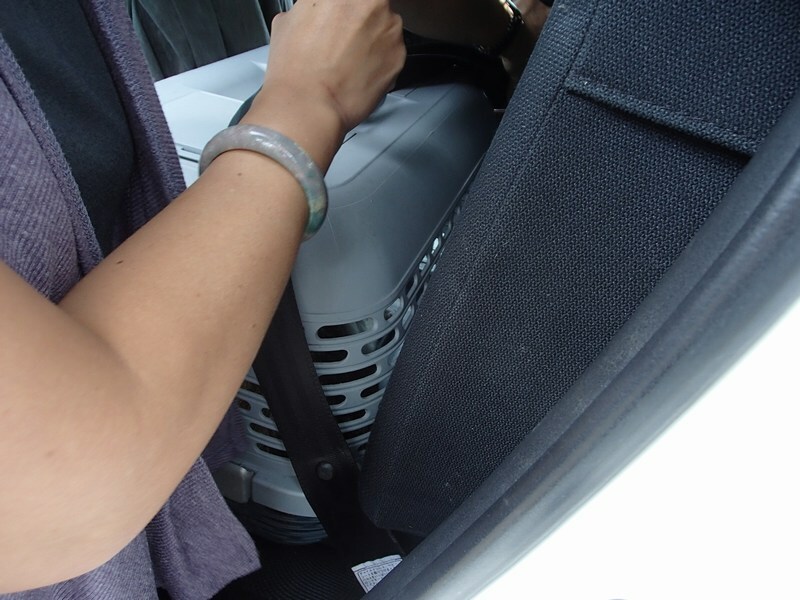 I put Dolly into the carrier, Connie secured carrier with the seatbelt and with two boxes of Monge loaded, we started on our journey to Dolly’s forever home. Dolly was very quiet in the car throughout the long journey. We reached our destination and my friend’s husband welcomed us warmly. As their experienced helper settled Dolly into their quarantine section (for new cats), my friend’s husband showed us a few big fishes in their pond – they had rescued these fishes from restaurants (so that the fishes will not be killed and eaten). Such kindness…. I’m so touched and humbled. 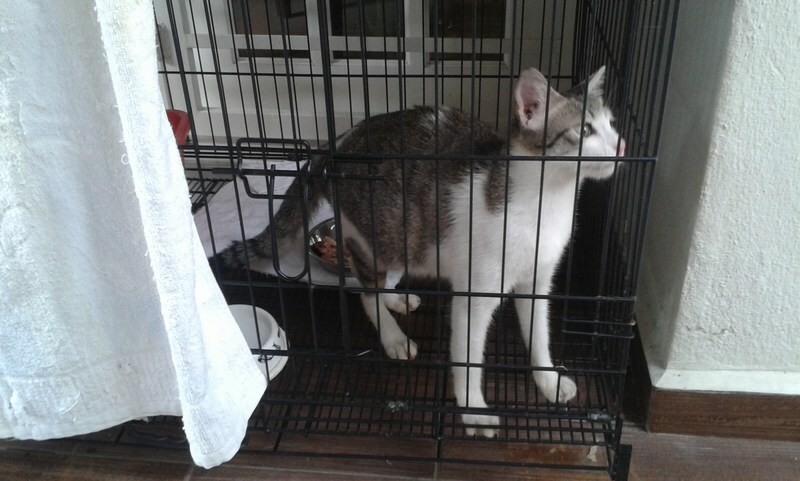 Rescuing pregnant cats is very satisfying for me, bcoz this will prevent strays and to prevent the kittens from suffering of being born out there with many challenges. I am indeed extremely fortunate to have such kind-hearted friends. From now on, Dolly will only eat delicious food. The world is full of kind-hearted people and I am truly thankful that I have the opportunity to meet them. 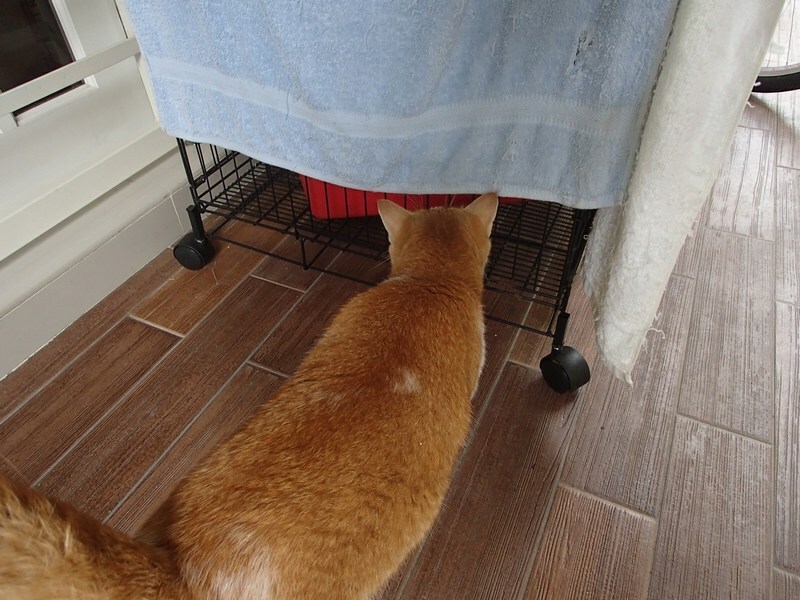 Ginger checking the cage after Dolly had left. Don’t worry, Ginger, Dolly is in a very safe place, a loving home. Three rescues in two days and all rehomed to loving homes. Thank you very much, all who have helped. We await news of the safe delivery of your babies! Everything happens for a reason and I’m so glad you shared this wonderful story with us. Your rescue is touching yet exciting! My tears fell when I read this story. I never knew that such kind-hearted and noble people like your friend still exist in society. 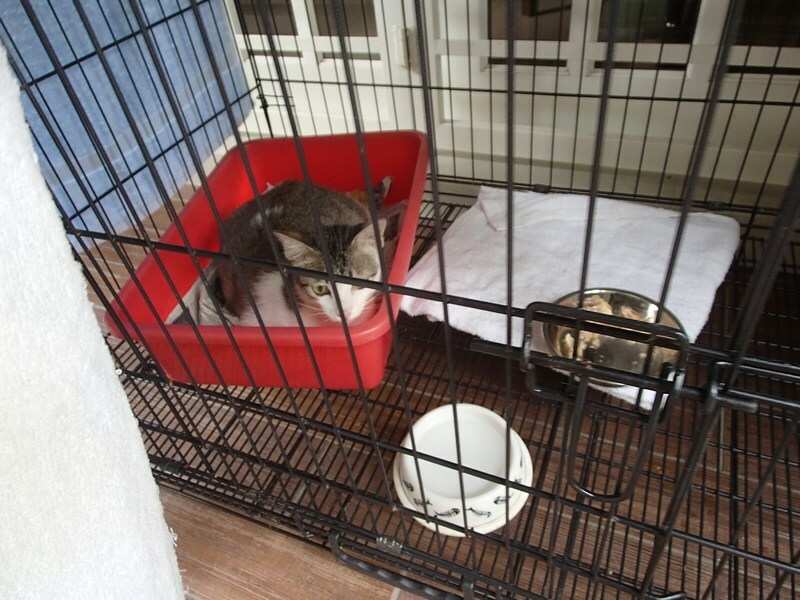 Imagine building such a lovely cat haven for the abandoned furry ones! And also a pond for rescued fishes from restaurants!